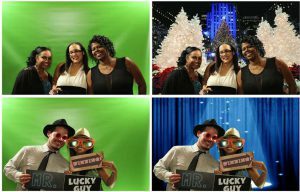 We offer an “Open” photo booth configuration! Our Open Air Booth is set up with a 10′ wide backdrop. Green Screen so you can take pictures with custom backgrounds! These backgrounds can be the Bride and Grooms name or a corporate logo or a seasonal scene for the holidays. We can incorporate any theme into the background! The Open Booth has fit up to 18 people at once! Your guests take one as a custom favor and you keep the other and if you like, we will put it in a “Photo Guestbook” which is assembled on-site by our attendant! 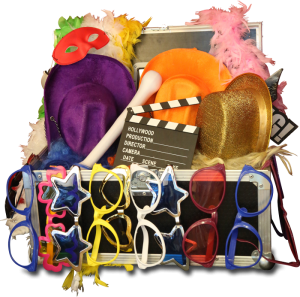 All sorts of wonderful and goofy props will be provided in our Prop Trunk for guests to dress up and pretend! If you have a specific theme that you would like them to dress up in (super hero, nautical, sports etc.) we can provide that too! A trained attendant for the duration of the event. A web site with all of the images that were taken by your guests. Complimentary customization of photo-strips to include text or graphics. Ultimately, we provide a premium service and guest experience that sets us apart from other companies.